Walter Schmid. Cover art: Corina Flühmann. 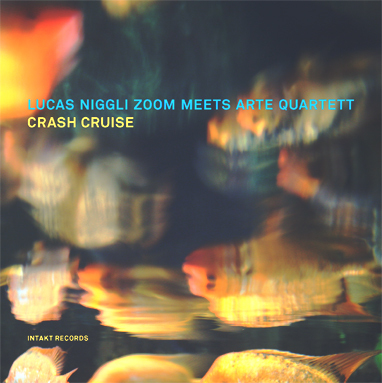 Performing with virtuosity, an intriguing variety of sounds, a blend of composed structures and improvisation, all of this happens by combining two outstanding jazz-formations: Lucas Niggli Zoom and the Basler saxophone quartet ARTE Quartett are going on a Crash Cruise. A musical Joint-Venture directed by drummer Lucas Niggli. Lucas Niggli is known for his ability to pair compositions, improvisations and different styles with his own musical ideas – and so creating complex and multifaceted music, but always keeping within his own recognisable style. The repertoire of ARTE Quartett, a formation which was founded in 1995, reaches from Arvo Pärt, Phil Glass and Steve Reich to Fred Frith and Pierre Favre. 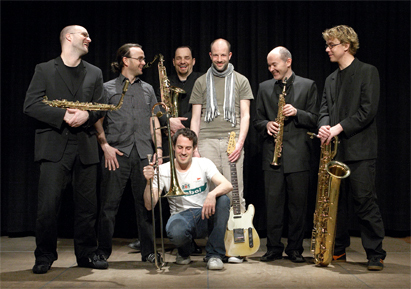 The quartet consists of four classically trained saxophone players: Beat Hofstetter, Sascha Armbruster, Andrea Formenti and Beat Kappeler. Their commitment lies with ‘Neue Musik’ and boundary-breaking stylistic cooperations and they mainly perform compositions, which were specially designed and arranged for Arte Quartett. And now they are working with Lucas Niggli and his trio. «The sound of it moves me,» writes Tim Berne in the Liner notes of the CD Crash Cruise. Nigglis Kompositionen haben eine ganz eigene Machart. Sie sind den Interpreten auf den Leib geschrieben und erlauben den Improvisatoren gleichzeitig viele Freiheiten. Festgelegtes wird von unerwarteten Interventionen dynamisiert, Formen aufgebrochen und auf Risiko gespielt. Es findet sich Heftigkeit neben Elegie, Dichte gepaart mit Ruhe. «Der Sound von Crash Cruise bewegt mich», schreibt der New Yorker Saxophonist Tim Berne in den Liner Notes zur CD.